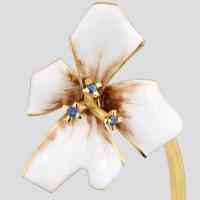 A truly iconic design, Tata Naka's first fine jewellery collection is centred around this unique ear cuff. 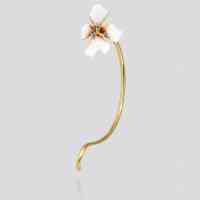 Combining the universal appeal of the casual flower in the ear with precious materials and hand painted cold enamel, the ear cuff will appeal to your inner diva. Wear it in contrasting colours alone or layered with any other ear piece in the collection for a striking Tata Naka look.